CLICK HERE for current schedule and learn more. 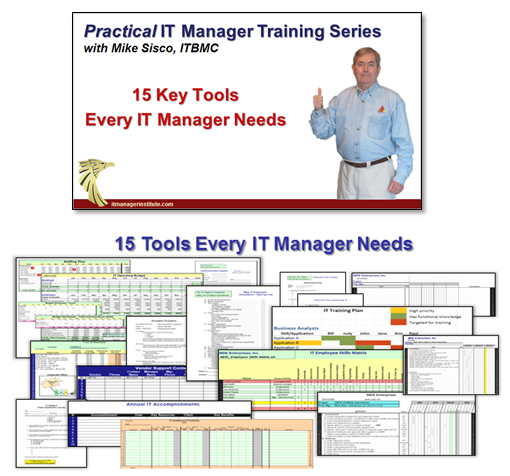 The IT Manager Institute is available in classroom and an online self study version, , , and we now offer a webinar version. 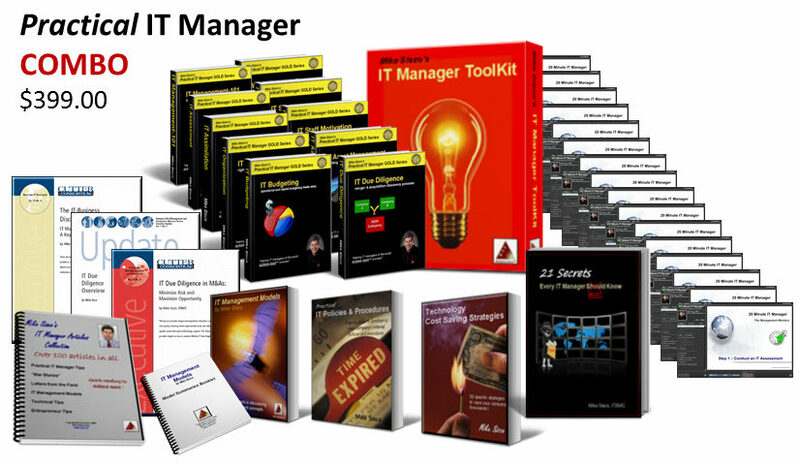 Each version includes identical presentation material and bonus items along with the ability to take the IT Business Manager Certification (ITBMC) exam. Learn about the Triple Threat to IT Success™, key traits of a successful IT manager, and the internal forces that tend to sabotage our success. The key to success is knowing what to do and what you can do. Follow my proven formula and use the tools I developed to conduct over 40 company acquisition assessments. A case study makes it very real. 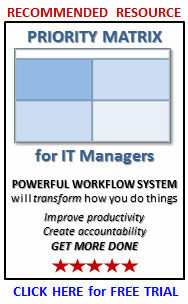 Don’t wait to be asked, , , develop your IT strategy now and gain senior management’s respect. This step is key in aligning with business need and objectives. I’ll even give you tools to help you prioritize your work. Delivering projects successfully is the path to credibility. Use simple techniques and tools to do so and you will separate your organization from others. Build an appropriate team to support the business and start by conducting a skills inventory that defines what you need and what you have. Focus on the gaps to get there quicker and more reliably. Learn to motivate your staff like never before, , , and with no money. A motivated staff can do powerful things and they will “walk through fire” for their manager. Sound processes can make all the difference for your organization’s effectiveness and responsiveness. Use my processes to simplify your life and to boost your productivity. I hate policies and procedures, but they can save you lots of grief. Learn how to develop and implement simple policies that work for you and your company. Budgeting needs to become a skill of every IT manager. Use my tools and techniques to simplify your budgeting process and deliver one that you can be highly confident in achieving. Get organized and keep it simple. My straightforward processes will help you focus this part of your business in an effective way. Every company has significant cost saving opportunities, , , and IT has the leverage. Your IT organization is the only organization that can help every department in the company reduce expenses or improve productivity. Learn where the leverage points are and go for cost savings that more than pay for your IT Manager Institute investment. Learn to track and report meaningful data. Simple tools can help you show IT value like never before and in such a simple way you will wonder why you haven’t been doing this already. Communicating effectively is more about knowing what to communicate and how to present it than anything else. Use my simple techniques to boost your communication skills. 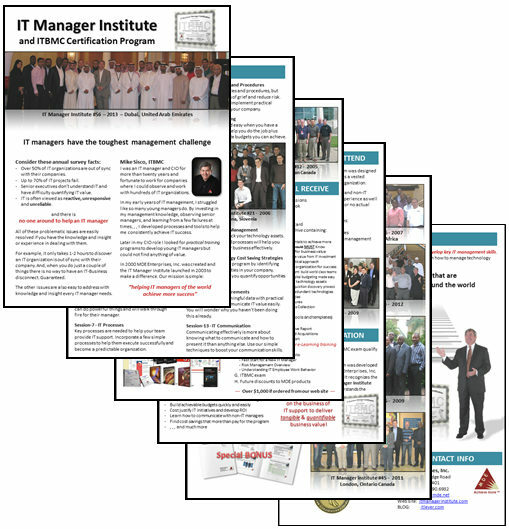 The IT Manager Institute includes the IT Business Manager Certification developed by Belmont University and my company, MDE Enterprises, Inc. It is the first certification to emphasize the necessity of your IT organization delivering tangible and quantifiable business value for your company. Now you can access the entire program online from your office or from home – same material as the classroom version that leads to getting your IT Business Manager Certification. This is our most cost effective program! The ITBMC is the only certification for IT managers that focuses on the business value necessities of delivering IT support and shows you exactly how to go about it. Included in the program is not only a path to follow but also all the practical tools and processes you need to immediately begin to achieve more success. There is more than management training here, , , learn why IT people approach their work as they do and what causes some things to be virtually impossible to succeed in unless we become aware and change our approach. Are you aware of the Triple Threat to IT Success? If not, you need to be because there are essentially 3 key things that cause an IT organization to fail. Learn what they are, how to avoid or eliminate them, and your success is more achievable.